If you're passionate about finding a cure for MS, then this is just the MS Awareness T-Shirt for you to rock at your next walk. Not only will you show off who you want a cure found for, but you'll also be wearing something that prompts others to take action and join you in spreading awareness. Our Multiple Sclerosis shirts are printed on 100% cotton, machine washable t-shirts, available in youth sizes XS-L & adult sizes S-3XL. Free personalization of any name is included. Love my shirt and it has my name on it that's a plus! Loved having my name on shirt. Since I'm fighting MS, it's nice to let people know what I'm battling. Additional Info Did you know that for every MS Awareness Gift purchased, a portion of your proceeds will go to the charity of your choice? 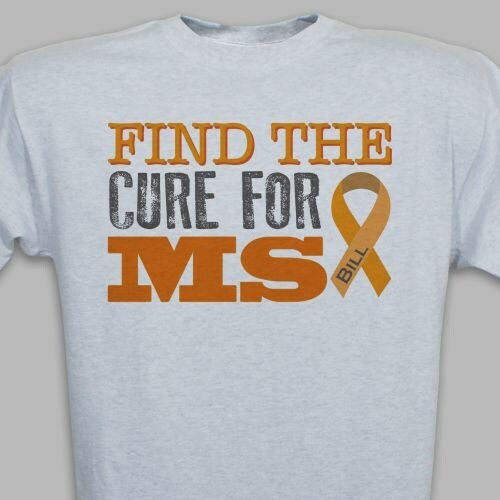 Not only will this Find the Cure T-Shirt look great at your MS event, but you can also donate a portion of your purchase to a MS-related organization. Our Find the Cure for MS Hooded Sweatshirt is another great apparel option.